A song in praise of the Munster cloak with its fine display of colours. One of the numerous airs composed by Carolan for the Burke family Bunting noted this air from harper Charles Fanning and the subject is Festus Burke, the 5th Baronet of Glinsk, Co Galway. This duet arrangement interweaves themes of five other Carolan runes in counterpoint with the main melody. This is the air to one of the few famine songs that have been passed on in the oral tradition. Johnny Seoighe was the famine relief officer in Carna, Connemara. The author of the song is asking him for help after he and his family have been turned away from the workhouse. The first of this pair of hornpipes was written for Anne-Marie’s son, Robbie in tribute to a very spirited goldfish. The Independent Hornpipe was first published in volume 1 of the Feis Ceoil Collection in 1914. Also known as The Independence Hornpipe, it has been said that it was composed after the USA gained independence from the British Empire in 1776. Originally written for piano in 1892 as the Prelude from Chants d'Espagne, this piece features scales and rhythms which are typical of Andalusian folk music. This arrangement for harp uses enharmonic effects based in the key of E minor to better suggest the sound of the Spanish guitar. Charles O'Conor was the eldest son of Denis O'Conor, head of the house at Belanagare. Charles was taught the harp by Carolan and he is the writer of the diaries from which we have learned much of Camlan’s own life story. The tune Lord Inchiquin was noted down by Bunting in 1792. O’Sullivan states that the subject of this melody is doubtless the 4th Earl of Inchiquin who succeeded to the title in December 1719. The family seat was Dromoland Castle in Co Clare. It is probable that Carolan composed this piece on his visit to Rev. Charles Massey in nearby Doonass. 7. Six Inches East of the Moon & The Astronaut’s Dilemma by O’Farrell arr. 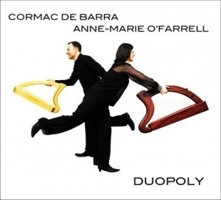 O’Farrell, De Barra These two slow reels are composed by Anne-Marie and make their recording debut here. The first combines modes typical of Irish folk music, while the second uses pentatonic or five-note shapes in the tune to reflect the Irish character. A work song for churning butter in which a mother encourages her child to climb upon the stool and join in the work. The interlude between verses is the well known piping jig, Banish Misfortune. In the folklore of Corca Dhuibhne, West Kerry, it is said that two Blasket Island musicians heard this air carried on the wind from neighbouring Inis Mhic Uileain and that it was the ‘Púcaí’ or ghosts who were playing it. This is the third movement of Scaramouche op. 165b, a work originally written for two pianos in 1937. It was first recorded in the 1940s, and is published by Salabert, Paris. Milbaud later made versions for saxophone and clarinet with piano. The first of these three jigs is composed by Anne-Marie in tribute to her home area, Dundrum, while the second, The Orphan (An Dilleachta) is a variant of a jig by Muiris Cuinn from Dun Son in Corca Dhuibhne. The final tune, Tom Billy’s, is a Sliabh Luachra jig named after its composer, Tom Billy Murphy, from Ballydesmond in County Cork. He was a well-known, blind fiddler who travelled the country on a donkey’s back over a century ago. Anne-Marie plays a 38-string Salvi Livia harp, a Salvi Diana pedal harp and a wire strung harp made by the late Colm Ó Meachair. Cormac plays a Salvi Egan harp, a Salvi Aurora pedal harp and a wire strung harp made by Phillip Murray. As a soloist, Anne-Marie’s unique levering techniques on Irish Harp and her commitment to the development of its repertoire have led to performances throughout Europe, the USA, Scandinavia, Russia and Japan. As harpist, composer and pedagogue she is regularly invited to present at international festivals and her works have been performed and broadcast on many continents. Cormac is the third generation of harpers in his family. As well as a solo career that has taken him around the globe, Cormac has also recorded and toured with a number of Irish artists including Clannad, Brian Kennedy, Julie Feeney, Maire Breatnach and Hazel O’Connor. He performs in a family trio, Barco, with his brothers Fionan and Eamonn and has released two CDs in collaboration with Moya Brennan.